Watching your team suffer a devastating loss is never easy. It is a hardship that can last for years. How about half a century? We’ve all been there. We’ve all stood in disbelief as we watched our team’s season come to a shattering end. When the cheering stops and the smoke clears, all you are left with is an empty field and your ticket. But not on this day and not for these fans! 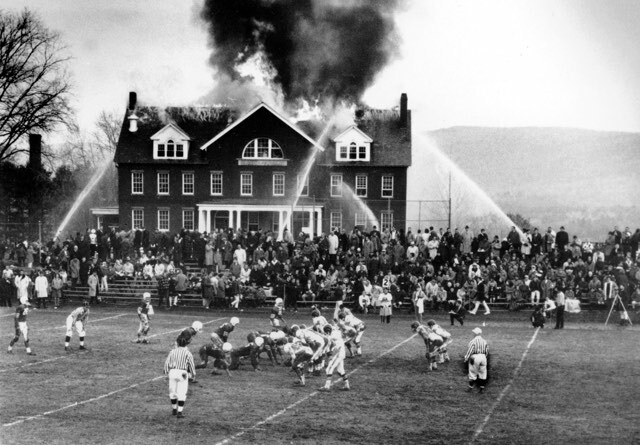 On November 20, 1965, more than 5,000 people watched Mount Hermon School lose to Deerfield Academy 20-14. When the clock ran out, the smoke remained and the field never hollowed; instead it was overcome by fire trucks, firemen and flames. Delve into the true story behind this photo, the history, and the man who captured it nearly fifty years ago. “NFL Films Presents: Playing With Fire” premieres this Thursday, October 22nd at 9:30pm/PT and Friday, October 23rd at 5:30pm/ET on Fox Sports 1.